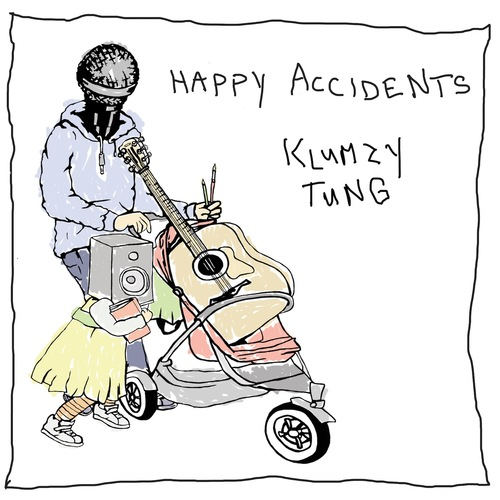 Klumzy Tung is proud to announce the full release of his eagerly anticipated debut album, 'Happy Accidents', in April 2014 via 'Tiefparterre Records'. To promote its release, Klumzy Tung will also embark on a ‘Happy Accidents Tour' with Mr.Dero and the band which will take them all over Europe, rolling through the UK between May 4th and May 10th 2014. The album ‘Happy Accidents', which features exclusive beat ‘n' bass heavy remixes from Beardyman, JFB, Mr.Dero, Dizzy Womack and Urbs, is the culmination of many years of musical exploration from the talented singer/songwriter, rapper and freestyler Klumzy Tung. Produced by his studio and stage partner Mr.Dero, it amalgamates his Hip-Hop and Drum n Bass background with acoustic guitar song-writing, incorporating a mix of clever lyrical wordplay and memorable melodies with inimitable social commentary, tung-in-cheek humour and an optimistic outlook. Klumzy Tung has taken a unique position within the world of music. For the last 2 years he has been releasing official videos for each song on the album, building a worldwide audience and gaining international recognition. He has had BBC Radio 1 airplay, European radio rotation and almost half a million YouTube views for the video of lead single ‘Counting Sheep', which was nominated for best music video by ‘The Smalls Film Festival' and ‘Rushes Soho Film Festival'. Klumzy Tung fell into music while ghost-writing rhymes for his brother ‘Risky', who was a UK Garage MC on pirate radio. This rapidly became an obsessive lyrical scribbling addiction that has snowballed into many musical happy accidents, including a chance meeting with beat-box champ and loop wizard Beardyman. This led to the forming of freestyle duo ‘The GobFathers' who performed fully improvised shows using audience suggestions to create ‘‘on the spot'' songs with a dash of random humour. Off the back of this Klumzy Tung met Mr.Dero at a show in Graz, Austria which was the start of what has turned out to be a long and exciting musical partnership. The ‘Happy Accidents' album follows on from previous successful creations which all began with Klumzy's breakthrough song ‘Little England' which also featured Beardyman. They teamed up again as a pair of free-styling, beat-boxing traffic wardens for E4's hidden camera series 'Web Heroes'. His stock rose once more when the single ‘Headscrews' with Mr.Dero was used as the soundtrack to worldwide TV series ‘‘Skins''. He's also performed numerous times at the ‘‘Udderbelly Festival'' and was recently named ‘Artist of the Month' on Austrian national radio station FM4. The challenge of attempting to record faultless one-take studio performances, led guitarist Andreas Furstner to declare the immortal words "Bob Ross always said we don't make mistakes... We make Happy Accidents" and so the album title concept was born.